I am so excited about this recipe! If there's one "comfort" food that I love more than anything it's Country Fried Chicken with Potatoes and Country Gravy, but I never eat it. Well...I might indulge once a year or so, but I always feel soooo guilty afterwards. Why, you might ask?? Well, a few years ago I bought this book that has all the calories from your favorite restaurants and 1 serving of Chili's Country Fried Chicken has 1560 calories and and 60 grams of fat...and one plate is 2 servings! Oouch!!! When I found that out, it made me sick. Thank goodness I can never eat a whole plate. But still!!! So, I've been determined to figure out a healthy version of this dish with all the yummy flavor and "comfort" satisfaction. I'm happy to announce, that I've done it!! This recipe has, by my calculations, about 430 calories per serving. That includes everything pictured below! The entire meal! How amazing is that...I've cut the calories by 1130, and it tastes sooo good. I honestly don't think I'll ever order Country Fried Chicken again. The key to the crispy chicken is the Panko bread crumbs. They are a must. Here in Utah you can find Panko bread crumbs at Macy's. They are in the baking isle by all the other bread crumbs. I use the Progresso brand. They are also in the Asian food section, Iron Chef brand, but those are a little more expensive. I always use the Progresso brand. The other key ingredient that makes this recipe a complete success is the fresh herbs in the gravy. The rich and bold flavor of the herbs, makes up for the loss of all that heavy cream and butter normally found in country gravy. I think fresh is absolutely necessary in order for this dish to provide the complete satisfaction of the "real" thing. Fresh herbs can be a little pricey, but if you are sure to use all the fresh herbs, the price can be justified. You can use them in several different recipes through out the week. You can also freeze fresh herbs, read here, and preserve their rich bold flavors. We're also coming up on 'farmers market' season, where you can find fresh herbs for great prices. 1. Heat the oven to 350 degrees. Line a baking sheet with tin-foil and spray with cooking spray. 2. Season the chicken breast with salt & pepper. Dredge them in the Panko bread crumbs and place on the prepared baking sheet. 3. Spray the tops of the chicken with cooking spray. 5. When the chicken is done. Turn the oven off and turn the broiler on. Put the chicken under the broiler for 2-4 minutes or until the top of the chicken browns up and is nice and crispy. 1. About 10 minutes before the chicken is done, melt the butter in a large skillet over medium heat. 2. Add the herbs and sauté for 2-4 minutes or until the herbs have softened. 3. Add the flour; stir until all the flour has been absorbed into the butter and a rough is formed. 4. Add the chicken stock and milk. Stir until the sauce thickens and gravy forms. 5. Season well with salt & pepper. 6. Serve over crispy oven baked chicken. 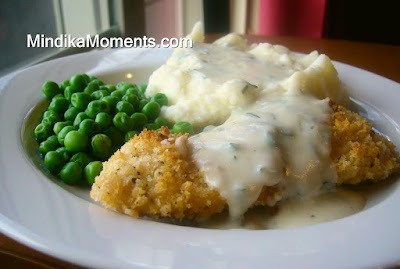 Serve the chicken with mashed potatoes and peas! I just stumbled upon your blog from the Utah Hive site and I'm so happy you've created a healthy version of the country fried chicken. I had a baby 3 months ago, so I've been really trying to watch my calories. I've been telling my husband for years now that we can eat good healthy food and still loose weight, but we've never done it together until now. Thank you for this recipe, I will for sure be trying it soon! My name is Susan Williams I was browsing internet and found your blog. The author did a great job. I will subscribe to your RSS feeds. Thank you for your contribution. I am a web designer myself. And here some examples of the websites that I designed for payday loan payday advance company.